We shouldn't say that “it was the best of pedigrees; it was the worst of pedigrees” because Iridessa is from the first crop of English Derby winner Ruler of the World (Galileo), and the grandly bred chestnut son of the great sire Galileo is half of Iridessa's pedigree. But even though the pedigree of the filly's sire is world-class, there's no escaping the fact that Iridessa is only the second G1 winner in the female line for 10 generations. The other is Iridessa's granddam Starine. This French-bred mare was a listed stakes winner at 2, then was purchased near the middle of her 4-year-old season and imported to the U.S. by trainer Bobby Frankel. The mare immediately placed in a graded event, and Starine improved enough to win the G1 Matriarch at 4 and then the Breeders' Cup Filly Turf in her last start as a 5-year-old. Frankel rarely bred horses and sent his star mare to the 2002 Keeneland November sale, where she sold for $1 million out of the Mill Ridge Sales consignment. Klaus Jacobs of Newsells Park Stud in Newmarket was the buyer, and the gray mare produced two foals for Newsells Park, the unraced Danehill mare Senta's Dream in 2004 and the winning Green Desert gelding Media Stars in 2005. One of two stakes winners by her sire, the Theatrical horse Mendocino, Starine was the only top-class performer for either of her parents, and that bright spark was snuffed out too early with the mare's death in late 2005. Iridessa, however, is the sixth foal out of Senta's Dream and the third winner. A winner on her debut, and the first winner in England or Ireland for her classic-winning sire, Iridessa has now won two of her four starts and was third in the Ingabelle Stakes at Leopardstown in Ireland. It may not be a coincidence that both winners of Newmarket's premier juvenile events followed a similar path to victory. Each was covered up through much of the race, then let loose nearing the Dip and won their G1s by having the pace to get to the front, then stay on strongly to the wire. 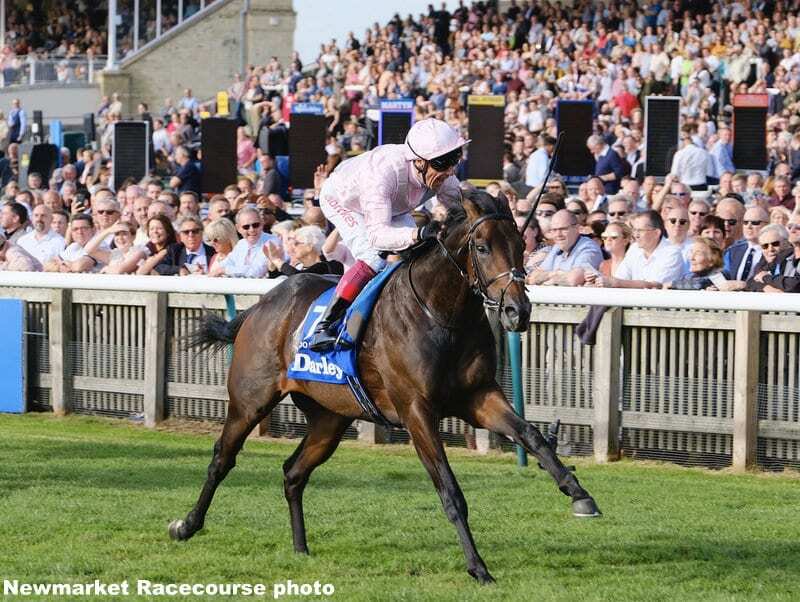 Nobody would argue that Too Darn Hot has the most speed of the two, and the colt's jockey was at some pains to throttle him back after a neat start so that Too Darn Hot would have cover through the early part of the race. At stud, Dar Re Mi has been just as impressive. From five foals to race, four are winners, including the full siblings Too Darn Hot (G1 Dewhurst and unbeaten in four starts); listed stakes winner Lah Ti Dar, most recently second in the G1 St Leger against colts; and So Mi Dar, winner of the G3 Musidora Stakes and third in the G1 Prix de l'Opera. The mare's other winner is De Treville (Oasis Dream), who is four times placed in G3 sprints. In turn, Dar Re Mi is one of four G1 winners from five stakes winners out of Prix Vermeille winner Darara (Top Ville). The mare's other winners at the top level are Diaghilev (Sadler's Wells), winner of the Queen Elizabeth II Cup in Hong Kong; Darazari (Sadler's Wells), winner of the Ranvet Stakes in Australia; and Rewilding (Tiger Hill), winner of Dubai Sheema Classic, Prince of Wales's Stakes, and third in the English Derby. This entry was posted in Bloodlines, Bloodstock, NL Article and tagged Bloodlines, Breeding, Dubawi, Frank Mitchell, galileo, Iridessa, pedigrees, sires, Thoroughbred breeding, thoroughbred pedigrees, Thoroughbred sires, too darn hot by Frank Mitchell. Bookmark the permalink.